You'll need to go somewhat off the beaten path, but it is possible -- easy, even -- to lose all your money in the stock market if you know where to look. Here are two ways to do it. If you simply buy -- without the use of any margin -- the entire stock market (or a small piece of it, really) via an index fund, it's all but impossible to lose all of your money. Indeed, an index fund represents an ownership interest in a well-diversified group of U.S. businesses; the risk of total loss is vanishingly small. However, once you venture off this path into more esoteric areas of U.S. securities markets, you can find any number of ways to lose your shirt. Following are two such areas. One of the very best ways to lose all your money in the stock market is to try to trade penny stocks, low-priced shares of very small companies that do not trade on a national securities exchange. I warned investors regarding this backwater in an article published a year ago, and I did so again this year. Among the venues where penny stocks trade, the OTC (over-the-counter) Bulletin Board has no minimum listing standards; companies need only find a sponsoring broker-dealer. By contrast, companies that wish to list on the NASDAQ or the New York Stock Exchange need to produce offering documents that are vetted by the Securities and Exchange Commission (SEC). Another venue for penny stocks, the OTC Pink marketplace, has neither listing standards, nor even any reporting requirements! Consequently, investors in penny stocks should be prepared for the possibility that they may lose their whole investment (or an amount in excess of their investment if they purchased penny stocks on margin). Exchange-traded funds (ETFs) have gained enormous popularity over the past ten to fifteen years, and with good reason: Investors like the convenience and low cost of an index fund they can buy or sell like a stock. However, investment banks and investment management companies always like to push innovation to excess. Exchange-traded funds' cousin, exchange-traded notes (ETNs), often fall into this category. Unlike an ETF share, which represents an ownership interest in a stock fund, ETNs are a form of unsecured debt backed by the underwriting bank. Furthermore, the mechanism by which they track an underlying index or commodity is complex and typically involves financial derivatives such as futures or swaps. 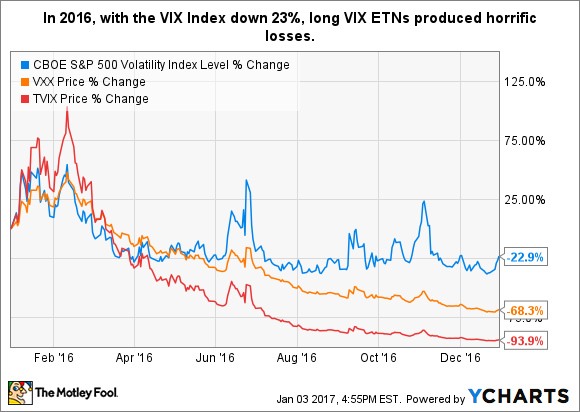 Two ETNs that track the popular CBOE Volatility Index (VOLATILITYINDICES:^VIX) (better known as the VIX Index) are good examples of this: the iPath VIX Short-Term Futures ETN (NYSEMKT:VXX) and the VelocityShares Daily 2x VIX Short-Term ETN (NASDAQ:TVIX). 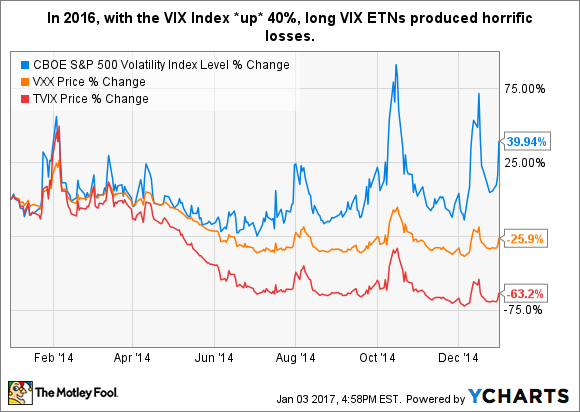 The index underlying your ETNs is based upon holding a rolling long position in futures on the VIX Index. These futures will not necessarily track the performance of the VIX Index. While the losses weren't as catastrophic as those for 2016, they're no mere flesh wounds. There is no way in which these products are suitable for individual investors (and I would argue they're unsuitable for professional investors, too) -- they are instruments designed to facilitate very short-term speculation, nothing more. If the applicable underlying Index declines or increases, as applicable, investors should be willing to lose up to 100% of their investment. Investing and gambling: Know the difference! Make no mistake about it: Whether it be penny stocks or ETNs/ leveraged ETFs, these securities have nothing whatsoever to do with investing -- they're a form of gambling (with terrible house odds!). In the first case, loss of principal is often linked to fraud and misrepresentation; in the second case, complexity and leverage are responsible. Leverage, in particular, is a wonderful accelerant when it comes to setting your capital on fire. Not surprisingly, it's present in many other situations in which investors can lose all of their money (speculating with stock options or in companies facing financial distress, for example).